I feel fortunate to be able to cover two card games. My very first article here was Solforge, a card game by Richard Garfield. So if you are curious about my card game history, that would probably be the place to read up on it! Hearthstone is a creation of Blizzard in response to their failed earlier card game. I also played the World of Warcraft card game (and have several of the raid decks still), and it was a very interesting concept. Hearthstone takes a few of the base concepts, and turns it into an all-new game. Like the WoW TCG, Hearthstone has character classes instead of factions, and does not require “Mana” like its predecessor, Magic: the Gathering. Each turn, players are given an item called a “Mana Crystal.” These are used to play spells based on their casting cost. There are pre-constructed decks, in which you unlock cards by winning games and leveling up (akin to Magic: the Gathering: Duel of the Planeswalkers), but you can also complete quests to acquire gold. Gold can be used to purchase decks. More on this later, though. My initial thoughts were admittedly quite mixed. I loved the original card game (and actually turned a profit with a few loot cards on the amount of money I spent building decks) and while I’m used to the idea of class-themed decks, I was a little less than thrilled with being forced to use certain characters. Maybe it’s because I’m such a big loremonger as far as Warcraft is concerned, but I could think of several other characters I’d rather see! I’d like to see a Mage deck using the Lich, Kel’thuzad, or perhaps instead of Garrosh Hellscream, maybe his father, the legendary blademaster Grom Hellscream. There are so many options, and I feel like perhaps Blizzard took some pretty easy roads. Perhaps more character choices will become a thing they add (if you’re reading this, Blizzard, take note!). If they do, I’m sure they’ll find a way to make a buck. That is perhaps one of my greatest qualms with Blizzard: everything has a price. I understand they’re trying to make money as a business, but look at the amount of players that play their games! Throw us a bone once in a while! I’d also like to take the time to thank Colton “Solanias” Leighton, Smitty “Smitty” Smitty, Eric “Biral” Marsh and Nelia ‘Nelianelly’ Gibson-Tremblay for providing me with additional images of this game! Each class in Hearthstone is represented by a Hero, and each has their own unique ability which can be activated once on your turn for two mana crystals. The ultimate goal is to take the hero that your opponent has chosen from full health to zero by any means at your disposal. Each hero’s ability can provide a little insight on to how they can possibly play. The classes also have their own unique spells that cannot be used by their friends or foes, much like Hearthstone’s predecessor. There are, of course, options. You are not bound to the abilities that your class offers, and using the neutral creatures (minions) can really adjust the gameplay. Minions have a variety of abilities that they come with, such as Taunt (you cannot target the hero until the minion is dealt with), Charge (this creature can attack the moment it comes into play), and others that are even more deadly. Not all minions are created equal, though. You only start with so many neutral minions, none that are especially overpowering. That leads us to the part that nobody wants to talk about. Is this game “Pay to Win?” To that I say yes and no. The game offers you several ways daily to acquire packs of cards, in the form of quests. Examples are “Win three times with a Paladin or Priest,” or “Win three times with a Hunter,” and other similar situations. A few of these quests can lead easily to 100 gold, which can purchase a pack of cards that contains five random cards. These could be anything from a simple 1 attack 1 health Murloc, all the way to one of the Elite Tauren Chieftains or the Defias Gang Leader. Now on to the part that isn’t fun. You can spend real money on better “Expert” packs. These come with more rares and better cards on the whole. If you are just playing casually against the computer, or against friends who are doing the same, I think you can have a great time. If you are seeking to play ranked matches constantly in hopes to see some sort of competitive Hearthstone community, I would not at all recommend only relying on quests for deck improvement. 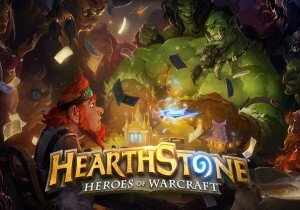 As someone who has played a great many card games, I can see a lot of similarities and differences between Hearthstone and the card games that have come before it. It has a resource like Magic, but unlike Magic, you acquire mana gems every turn. Only one deck so far has the ability to “ramp” or increase the count of mana it has, temporarily or permanently, and that is the Druid deck. Similar to its predecessor WoW: TCG, it uses a deck leader system that focuses the win condition solely upon them, but unlike the other, you only have a deck of 30 cards, and two of a card instead of four. The community for this card game took off as things on the internet tend to do, and there are already a host of well-documented, successful decks. There are a whole horde (no pun intended, I swear) of websites that show off what decks are winning, which are not, and what cards they contain. In a roundabout way, I think this will lead to Blizzard making heaps more money off of this game! Now that people know what works and what does not, those who wish to be competitive will spend the money they have to on packs, since individual cards cannot be bought. This is smarter for them than Wizards of the Coast, who cannot control individual card sales per se’, and so they do not make money off of the sale of them. Used video games do not generate profit for the game developers, but only for the stores that sell them. In this, we see that Blizzard would do well to keep these sites going since the spirit of competition will only provide more for the coffers of the titan responsible for World of Warcraft. Balance is a funny topic for card games. It is my opinion that in Magic: the Gathering there is an answer to every combo. If someone is running Hypergenesis creature overrun, there is a way to deal with it. If someone is running Channel-Fireball, there is a solution, several solutions. But in a fresh, new card game, there is not quite as much time to balance or fine-tune. Granted, this is now an open beta, so many players can test the game and give Blizzard information on what is overpowered or undertuned. Though I fear that, given Blizzard’s track record of “balancing,” that some of these incredibly powerful deck concepts will not see weakening anytime soon. I will admit, some of the Mage combos and spells did get weakened during the closed beta, I did not much else in the way of balancing during my tenure in the closed beta. Few card games can be seen as balanced. In every new set of cards, new combos get used. Some are used often, some are used less frequently. There is always a tier-list, of which classes or deck archetypes are better than others. These will no doubt see more use than others. At the time of writing, I believe Rogue is the top class. There are several very powerful combos to come out of the Rogue archetype such as Defias Leader Combo, where you play a series of very cheap spells from your hand, and combo Defias at the end, flooding the field with free minions. Or you could just opt for Mage, and keep the field controlled and wiped, with a host of frozen minions, unable to attack. My personal favorite is one of the “lower” tier classes, but I do well enough with it, without having to spend money. Do I have any intent on spending a bunch of money on this game? No, lord no. Do I think people should? If you enjoy it, then absolutely. I’m of the opinion that if you enjoy a game, spend a little money on it if it’s free. Whether it’s buying skins on League, items on Dota2, or buying a few packs here and there in the game, there’s no harm in that. Just remember: Moderation. Moderation is the key to enjoying anything. This one is certainly up in the air. I love card games, and while I think this might be a little bit of a bias, I certainly enjoyed Hearthstone. While I do not enjoy the luck factor opening packs and getting the cards you want, it is still fun for casual play. It is certainly a title that can and will go far, and no doubt Blizzard will make piles upon piles of money with it, but until I can purchase individual cards for a deck, I do not really feel I will spend much on it at all. I will of course play it. Again, see where I said I love card games? It’s a fact! It’s got a great atmosphere and an interesting concept. It is not the best card game I’ve played, but certainly far from the worst. The graphics, while similar to WoW, are very static. But, I gave it a 3 because there are lots of little, subtle things about the graphics that I frankly enjoyed. The stages always have an interactive set of items in the corners for you to mess with while you wait for your turn to come up. For someone who is easily distracted, this could be a bad thing! But I doubt it. It’s more of the same, but I do not think this is necessarily bad. The controls are very smooth for a card game on a PC. I cannot ask for much more than easy access to cards, easy zoom in on enemy cards, and for things to move when I click on them. There were some pretty horrendous control schemes in other card games I have played on the PC (such as Duel of the Planeswalkers), but the controls were very solid for. There are not a lot of extra features for this game. It does not necessarily need them, but that does not mean there cannot be more. There is the Arena, where you can do battle with random players for packs of cards, ranked and casual matches, and practice mode. That is pretty much it. Kind of short on stuff to do, but at least the quests give you something to push for, in that they can get you more packs of cards. Normally, I love the music that Blizzard produces. The music really fits the setting, in that it is a sort of tavern or inn, and the bright, cheery music really goes with the feel of the game. But it can become very tedious very fast. The sounds and feels of the game were interesting, and really draw you in as a player, but the sounds of the cards that are played, and the limited heroes and sounds can become monotonous. Which is unfortunate, because they sound terrific. Outspark is celebrating Luvinia Online's first year anniversary.